New colours for old provide pretty pageantry at Britain's busiest railway junction. Racing through Clapham Junction are just four of the 2,200 trains which pass its platforms each weekday. Centre is Class 50 No. 50023 Howe with a Waterloo to Salisbury service overtaking a Class 455 electric multiple unit, one of the new generation of suburban trains fitted with passenger-operated push button sliding doors and public address equipment. On the right is a Class 73/1 electro-diesel on one of InterCity's "Gatwick Express" push/pull shuttles which run every 15 minutes throughout most of the day between Victoria and Gatwick Airport. Lurking shamefacedly on the far left is an ageing Class 423 EMU still sporting the old rail blue and grey livery. 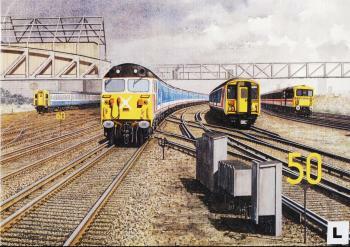 The Class 50s - nicknamed 'Hoovers' because that's exactly what their 2700hp engines sound like - were introduced in 1967 when uniquely they were leased from their makers English Electric before eventually being purchased by BR. Originally used double-headed on West Coast expresses between Crewe and Glasgow during the run up to electrification, they later went West to be employed on the Paddington to Plymouth and Penzance, and Waterloo to Exeter routes, which is when all 50 locomotives were named after warships. Both Howe and the Class 455 are painted in the eye-catching Network SouthEast livery of blue, red, white and grey introduced in the summer of 1986 when the Sector changed its name from London and South East. These distinctive new house colours - applied to both rolling stock and station buildings - help to remind customers that a single Sector is now responsible for the strategic planning and marketing of all BR suburban and outer suburban services on the 2,500 route miles radiating from London and which serve the South of England. On a typical weekday, Network SouthEast handles 38% of all commuters travelling into London - a total of 420,000 people pouring through its stations in the space of a couple of hours. Network SouthEast has also achieved what many passengers once despaired of ever seeing and broken down the 'them and us' attitude between BR and London Regional Transport with a variety of tickets and railcards which allow easy interchange between NSE, the underground, London buses and the Docklands Light Railway. A massive £952 million programme of improvements is planned over the five years from 1987 with the money going on new and refurbished stations, new trains and more electrification. Perhaps the most mould-breaking of all its electrification schemes is planned for completion in May 1988. Called Thameslink this new cross-London service will finally allow suburban trains to travel direct from north of the Thames to Kent; with ample connections to other parts of South London and Surrey. Thameslink will make use of the old line through Snow Hill tunnel under Holborn Viaduct which was originally closed to passengers in 1916 as a result of service economies in the First World War. Its re-opening symbolises the resurgence of public transport in London with Network SouthEast at its forefront.